- design of performance, creation of properties, creation of cardboard and paper costumes - under the leadership of the Minister of Education Cardboardia Olesya Kandalintseva and Cardboardia Space Minister - Artem Gapurov. During the period from October 22 to November 1 in Moscow (Russia), we will prepare and implement an events under the motto "Nightmare» . 31 October will be final even in Park Muzeon Summer Cinema venue. We invite to participation beginning artists, designers, architects, photographers, students of pedagogical colleges and everyone who is interested in making art. Take part in our intensive practical course - which will teach you the basics of cardboard- modelling and making performances with people. The course is optimal as practice internship for students. An actors, performers, directors who would like both get new interesting experience of creating performance from the very beginning and improvisation and take part in the organization of the process. Managers, feeling power, opportunity and desire for communication with public in the process of performance, who want to develop themselves in these directions. Your education is something we're interested in, but we don't consider that, choosing you as a participants. We're giving the probations different and sometimes unexpected tasks and an opportunity to take part in creating real projects. The way you are involved in participation depends on your desires, talents and diligence. For the experienced specialists the internship can become a base for an experiments, public realisation of art plans, research for the new directions. For the students and beginners the internship can become an opportunity to make first steps and a place where you will be accessed by what you're doing, not your diploma and portfolio. Working hours - not less than 6 hours per day, so there will be minimum 5 days of working (in frame from 22 october to 1 november) and than final events (31 October and 1 Nobember). Individual schedule will be specified during the interview. 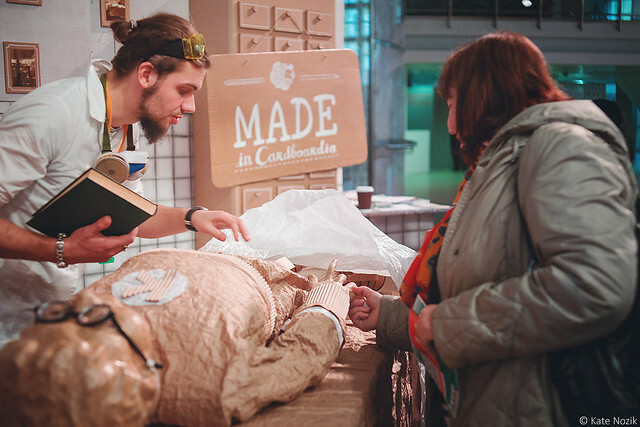 According to the results of internship our participants get a chance to become full-time members of "Made in Cardboardia team"- both in Russia and overseas. There will be more information about place there internship and final performance will take part. 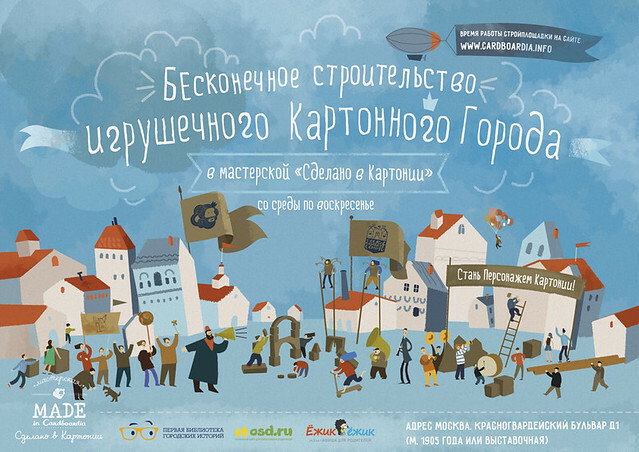 We are open call for participation in the first practical course work with cardboard in Latvia under the leadership of the Minister of Education Cardboardia Olesya Kandalintseva. During internship we will develop projects for Carnival in Poland (Lublin) and Street Theater Festival in Denmark. Working hours, 11am- 7pm. Schedule will be specified during the online interview. 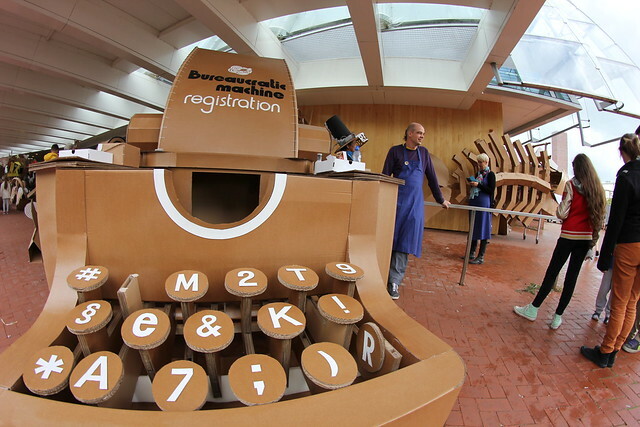 July-August, 2015 Cardboardia Personages are going to realize several projects in different countries around the Europe and invite everyone to join their free and variously directed internship programs. Under the guidance of Tyran, Minister of Education and Minister of Circus announce an opportunity to join them in order to prepare and carry out street performances. We will be creating cardboard objects and costumes, making up stories, learning to mix with audience, walking on stilts, joking silly, solving organizational issues. 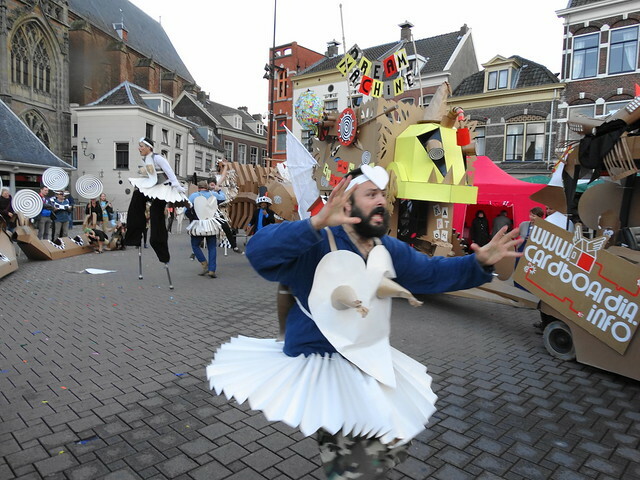 In the course of our work we'll take part in several Cardboardia street performance on different festivals. Participation is free and without compulsion, after preliminary interview! Participants are to bear their daily expenses and travel costs on their own. You can join the full-term project or just a part of it, but not less than one week period. There are no more than 4 open positions at a time. Age 18 up. Personages of Cardboardia are happy to welcome anyone who wishes to create big, perform loud and parade the streets of Derry! If you want to learn how to create characters and worlds with cardboard or get better at what you already know; if you are looking for a powerful experience, or be a part of a large creative project and make new friends - apply below and join us at the Lab! The Lab will end in a series of performances on 23 and 24 of May. 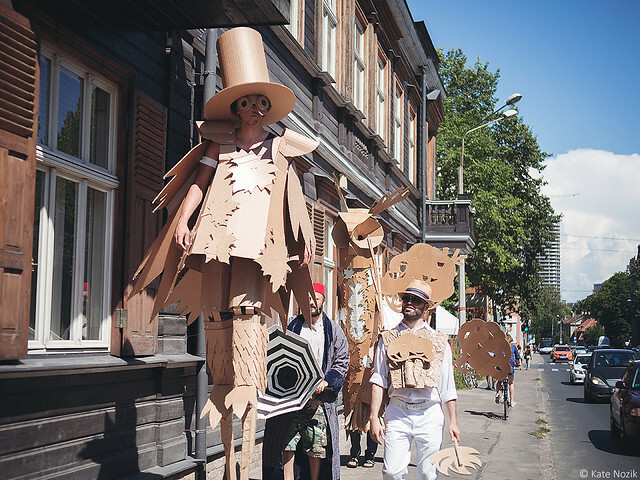 Curators of the Street Performance Lab are: Mathijs Stegink, NL (artists, animator, trainer and teacher), Olesya Kandalintseva, Rus (artist, designer, workshop curator at Made in Cardboardia), Wolfgang Hauck (street theater director, stilts walker, homeopath). Lab participants will need to take care of their daily expenses and costs of travel and stay in Derry/Londonderry (Northern Ireland).